Aarrgh! And ahoy mateys! September 19th is Talk Like A Pirate Day. To celebrate HostGator is having massive sale! 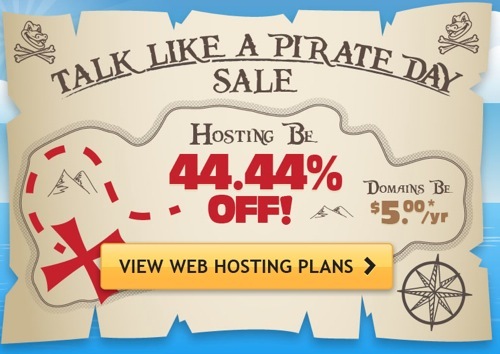 They’re offering all new hosting orders at 44.44% off and new Domains at just $5. With the savings you can actually get a shared hosting package for as low as $2.76/month! So, what are you waiting for? Go claim your booty! Before you know it you’ll be one step closer to having your website up and running.